After reporting last week that speakers at the Republican National Convention chose to attack their opponent more than support their candidate, we quickly heard from some people who were sure the Democratic convention would be no different. @rollcall Check back w us w the same quest next wk. It will be reversed guaranteed. She can&apos;t prom her record. All she has is to bash Trump. Democrats appeared more eager to promote and defend their candidate than Republicans were, according to a review of transcripts and prepared remarks by 36 current elected officials who spoke in Philadelphia this week. Sure, there was plenty of Donald Trump bashing, with 187 mentions of him between the speakers that Roll Call analyzed. But they invoked Hillary Clinton’s name more: 251 times. In contrast, a Roll Call review of 22 speech transcripts of the GOP elected officials who took the podium in Cleveland found 135 mentions of Clinton and only 86 of Trump. In Philadelphia, President Barack Obama — who gave one of the longest speeches of the Democratic National Convention — mentioned Clinton 28 times. That was the most of any speaker. He said Trump&apos;s name seven times. Democratic vice presidential nominee Sen. Tim Kaine of Virginia, meanwhile, proved his capability as an attack dog . He went after Trump by name more than any other speaker — 26 times — also throwing in a few impressions of the billionaire real estate mogul and reality television star. But Clinton, whom we didn’t include in the count because she’s not a current elected official, took plenty of her own jabs at her GOP rival. 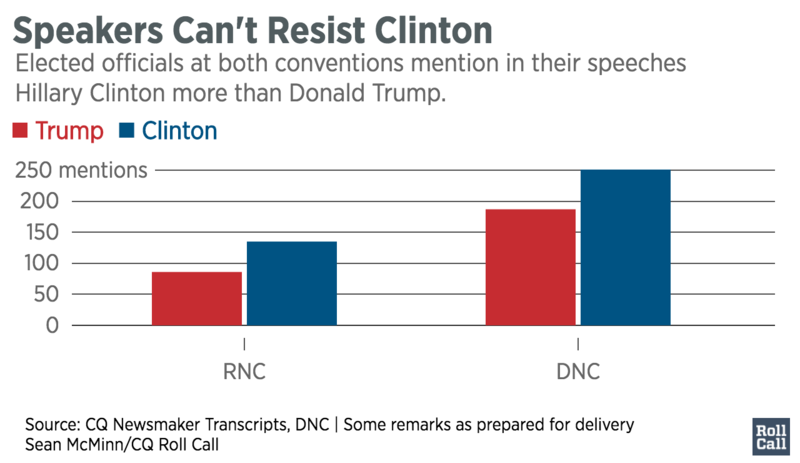 As Trump correctly noted on Twitter on Friday, Clinton mentioned him 22 times in her address. In his speech, he only named her 11 times.